Prepare dressing by gently whisking lemon juice with olive oil. Add grated ginger,salt,pepper and mix well and dressing is ready. Grate the carrot in processor or grater. Now add redchilli and coriander leaves and mix well. Now pour the dressing and mix well. Dry roast the flaked almonds and add to salad. Gently mix the salad and serve with salad leaves. 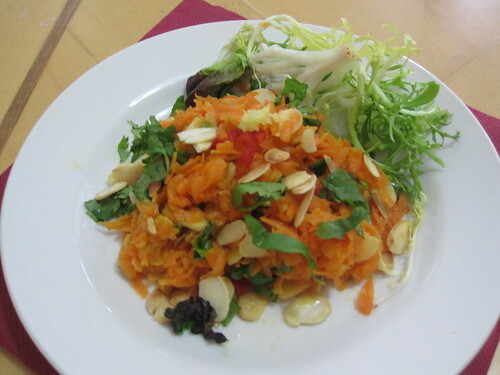 This crunchy Carrot Salad can be served for evening snacks. flavorful indeed! I can eat carrot salad anytime! 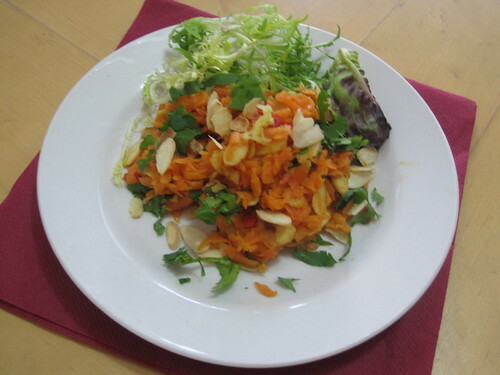 Carrot salad looks yummy...and dressing used is very simple and adds special boost to carrot. looks very healthy and delicious..
Would love to have this salad for my dinner..
That is an healthy Salad and I make something similar but more indianized, using Indian spices. Carrot salad looks colorful and delicious. It was fun running the marathon with you Ila. Hope to do it again very soon. Enjoy your weekend.